By AnnieRSA, November 19, 2012 in INTRODUCE YOURSELF! I'm going to have a look and see if we can get some Ensure here. What worries me is that this is only the first dose of chemo and already she is finding it very difficult to cope. Don't want it to get worse with the next two doses. 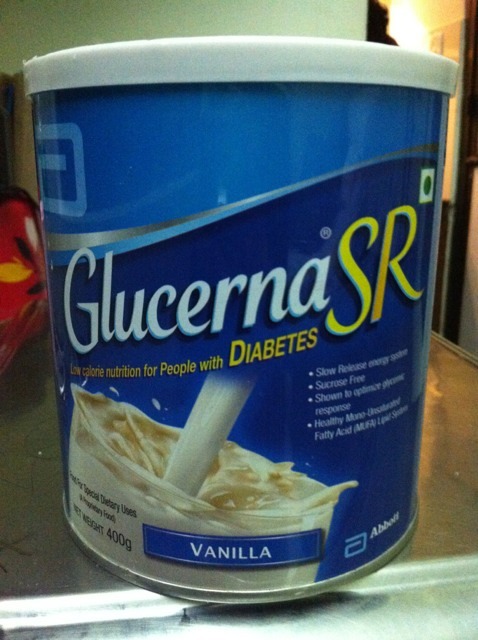 With mummy refusing to eat / drink anything, we got her some Glucerna for diabetics (by Abbott). The medical store said this is what they provide instead of regular Ensure which is not for diabetics. I honestly didn't know it would be such a mission to get her to eat and drink. She outright refuses to consume anything. Even water. She says the smell and taste of almost all foods and drinks makes her not wanna eat. Then adds she doesn't have the energy to chew/swallow. Now she complains the smell of the Glucerna (vanilla flavour) is also putting her off. It has now become apparent that she isn't eating much because her face looks so drained. I really don't know how else to feed her. I'm also worried all this medicine without food is gonna hurt her more. Her blood glucose has now come down to regular levels. The nurses say that's coz they took her off the steroid. However they are keeping on with the insulin. But if she doesn't eat, I don't know what will happen. She says her chest has started to pain very slightly in the middle. I can only assume this is the chemo working? Or should I be worried/notify the nurses? The only thing she really drinks is blended oats. So I'm thinking if I can add some of the Glucerna to her oats. The directions on the tin says mix with water. Any thoughts? Has anyone tried this before? It certainly wouldn't hurt to try to add a little of the Glucerna to the oats -- maybe just a little at first so hopefully she wouldn't even notice. Have the doctors suggested anything that might help? I know there is a condition called cachexcia (spelling may be wrong) where cancer patients can't or won't eat - Randy knows quite a lot about it, but I'm sure you can google it. You want to avoid that if at all possible. So anything you can do to sneak in nourishment is a good thing. I would certainly report any new complaints to the nurses/doctors. I remember one of the hardest things was to determine sometimes what might be a separate problem, or what was simply another side effect of the treatment. Best to err on the side of caution. I am praying things get easier for you and your Mom. That is our plan Diane. Thank you for the backup!! I was just thinking...It's amazing how there's just so many (infact too many) of us all suffering in this world, and yet how much less of it the media actually "sells" to the public. Surely if due attention is given to such conditions the world would become a much better place for all of our brothers and sisters. I too am praying for all of our dear ones in pain and suffering. Finally a slight breakthrough. She was refusing to eat or drink anything since yesterday. Literally crying and begging us to stop asking her to eat. Now a nurse came by and told her how lucky she is to even be able to talk or cry because there are other patients in rooms next to here that can't even breathe properly, eat drink or talk properly and that they are on an IV drip all day long. I'm so happy and am hoping this will continue. She badly wants to go home. Thank you all for your prayers. God bless! Is it not possible to do lung transplant in such cases as NSCLC? As far as a transplant I don't really know for sure due to her staging on the lc, but I'm sure others will follow me who have more knowledge than I do. Tell your mom to keep up the good work because there are people who "care". That is wonderful news that she is trying. Sometimes we just need a "wake up call" to get things in perspective. She may have been experiencing some depression, which cerrtainly would not be unusual under her new circumstances. My oldest son asked my pulmonologist about a lung transplant. This was post-treatment, and because radiation had done so much damage to my one lung. I can only tell you what he said - and I think it would be different in other countries. According to my pulmonologist - assuming you are not considered too old for a transplant, and your cancer is in remission - lung transplants apparently come with all kinds of risks and problems of their own. He said that for someone like me - who has one lung left, which has been damaged by radiation, but is still working relatively well - I have a better chance of living longer and better with my lung, than I would if I had a transplant. Also of course is the scarcity of organs, and how unlikely someone like me would be to even get a lung if that were a good option. Of course that is just his opinion, and I haven't done any research on it. I am very very glad to hear your Mom is trying to eat. Small steps are good. I read up on discussions about lung transplant after hearing about the possibility in one case. Unfortunately, it isn't a reasonable option, except for a very lucky few. 2. If you have cancer that has already spread elsewhere, the cancer cells are presumed to be wandering about your body, so replacing lungs won't help because the cancer cells will just float back to the lungs and start the cancer again. Chemo sometimes eradicates such cancer, but the odds are too small to risk wasting a donor's lung vs. giving it to someone who has good odds of getting 20 years out of it. 3. There is one potential exception. The BAC (bronchioloalveolar carcinoma) subtype of adenocarcinoma often (not always) stays confined to the lungs and progresses slowly, so if the lungs are removed cancer might not re-seed the lungs so easily. From what I've read, the odds are about 50% that the cancer will return. That is not good enough for some lung transplant surgeons who would like the donor lungs to last many years in someone. From the point of view of the BAC patient, it's a "win-win" because if the BAC doesn't return they live years and even if it does return the BAC might progress so slowly that they might get as much as 4 years out of those lungs. Even so, I know someone who searched nationwide for a lung transplant surgeon who would was willing to do the procedure of his wife with BAC. He only found two (after screening dozens). Unfortunately, lung transplant surgery is pretty risky, and although her transplant was initially successful, she died a couple of days later. Someday when lungs can be grown from stem cells, we might have unlimited spare parts made to match our own tissues. (It's a shame that some politicians blocked government-sponsored stem cell research.) Then the problem is treating mets elsewhere, but in an ideal BAC case that shouldn't be an issue for years. I sure wish they'd hurry up with that -- it could be a life-extender for people who's front-runner cancer issue was lung impairment. Craig -- thanks for that infor. It's all pretty much in line with what my doctor said -- only you've said it better. Ladies,Craig...thank you for the most valuable information and support. I am always grateful for you all. Craig, you have a way of putting the most complex things into easy simple words. That makes it so easy for laymen to understand. The doc came in and mummy explained all her tummy issues to him. Including her difficult to eat even if she wants to. He has now prescribed all meds and supplements will be given IV. She is only to take water to wet her lips etc. He wants to do this for 24 hours under observation and then will tell us what to do next. She's been on drips since yesterday evening. I'm worried if this will continue and become a problem. Anyone have similar issues when doing your first ever chemo? Or is this unique to her case? I think there are as many different types of response to chemos as there are types of chemo. I am driving an older lady to chemo now who is having lots of stomach and loss of appetite issues. I know this doesn't help much as regards your Mom's situation, but I think it is good that the doctor is paying attention and taking some steps to see what can be done to help. It is not uncommon when people are having stomach issues that the doctors take them off all food for 24 hours - I think the idea is usually to give the stomach a rest and then perhaps start adding easy to digest things a little at a time. I hope your Mom can find some relief from this. Oh okay Diane. That actually sounds very logical. Thank you for taking the time. Mummy's energy is slowly returning and her tummy is better albeit some gas that always seems to be "hanging around" and giving her discomfort. We then apply hot water bottle to her tummy until she sleeps. The doc said her count has returned to normal and they are slowly starting to ween her off the injections and IV's. 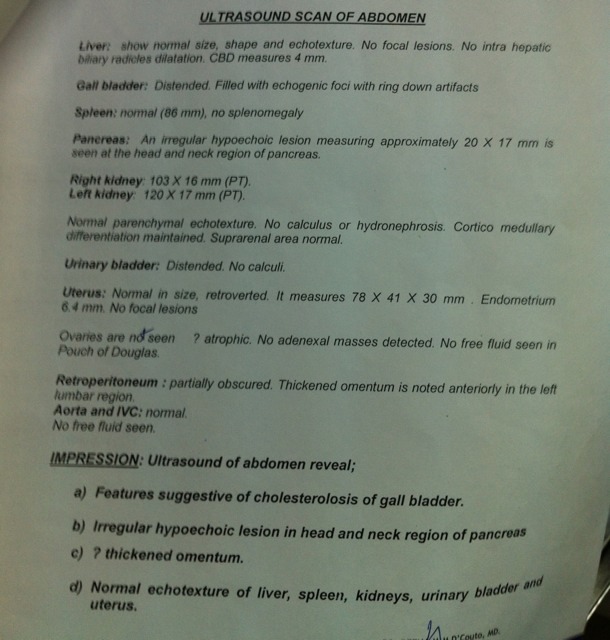 Some dumb a** doc came by the other day and said based on the ultrasound scan (attached) the cancer has spread to her stomach too. I for the heck of it, cannot see anything that says so on the report. The previous report in South Africa said they found some weird thing in the pancreas but nothing cancerous. This we are all aware of and is not news. Can anyone else perhaps comment on the report please? I really get very frustrated when doctors say such things. It not only scares the crap out of my mom but also makes us worry for no reason. In addition the gastro doc had a look and said why not do a ct scan but the oncologists said there's no need as we already did a ct scan in South Africa and so no need for another scan now. Weird! Following a few mini battles at home we are back in hospital now. Today the doctors got mummy her second chemo round. This time they chose to go for carboplatin instead of cisplatin. Having done some reading I've come to the conclusion that carbo is less effective than cis, however carbo is less taxing on the body in terms of side effects. Does that mean she will need to undergo more than the three initial rounds of chemo the doctors ordered ? We still are awaiting the test results to determine whether she has the EGFR mutation and can be put on gefitinib tablets following her three rounds of chemo. Her tummy issues have settled and her increasing dependency on oxygen has totally disappeared. She had been needing oxygen every few hours and now she doesn't even use it for the past few days!!! She does complain of very low energy levels and even though I thought she would bounce back a week or at Max two weeks following chemo, her energy is still quite low. She also has recently developed aching pain in her right leg calf muscle. We been rubbing and massaging it for her and that helps a little. Wonder if it's got to do with the diabetes, which I must add has been quite stable and she is only using the glyciphage tablets, no insulin injection. The docs had previously ordered her off all medication she was on (such as her thyroid tablet - eltroxin as well as her puff pump for mild asthma) but yesterday ordered that she continue with those again. I'm confused why. With my brother and his wife leaving India tomorrow, my sis and myself leaving later next week, mummy and daddy have both started stressing about how to continue until my sis comes back as soon as she can (Possibly within the following week itself). The stress is really showing its face in different ways and I am tempted to resigning at work and staying here full time. The developments in this coming week will help decide the way forward. Thus far God has been exceedingly merciful to help us through every single stage we came through YAY! I was switched from cisplatin to carboplatin because I could not tolerate the cisplatin. I worried also about the fact that I was giving up the "No 1" drug for the "No 2" drug. My doctor assured me that the statistics were really quite close, and printed out some medical journal articles for me to read. That made me feel a little better about it, and actually I'm still stable 4 years later having had the carboplatin. I am convinced the cisplatin would have been much harder on me physically and in the end that would not have helped my overall survival. As for the other concerns, of course you should mention them to your mother's doctors, but for me the fatigue didn't go away until I was completely done with chemo, and even then it was a gradual improvement over a number of months. Because the effects of chemo are cumulative, if that is the cause of her fatigue she will mostly likely become even more fatigued before the treatments are done. I know I've said this before, but she is very lucky to have such a caring family. Your words are a great source of comfort, information and relief. It's good to know We have the support of everyone here, and the encouragement really helps and reassures us every time. Thank you Diane. I truly value your comments. Haven't heard from CraiginPA for a while. I hope everything is okay with him. FWIW, I haven't said much lately on this discussion because I didn't have anything useful to add and I don't have experience with the stage of treatment your Mom is getting. I'm keeping an eye on the discussion, though. You've been in good hands and good company. Craig - I may be the only one who doesn't know -- but what does FWIW mean? I'd guess it's the 3rd most common abbreviation in email messages after FYI and BTW, and more common than IMHO (or IMO). That is a great link - thanks!!! I'll use it often I'm afraid. Unfortunately our very famous and experienced oncologist isn't the most readily available person to talk to. Purely because he is in demand at two other hospitals and at his home where he consults in the mornings. And when we do get him here in my mummy's room, he is gone in a matter of 2 to 5 minutes. That's all we see him during a 7-day week..5 very short minutes. The rest of the time we see his junior (consultant) doctors and (the short-staffed) nurses who don't really seem to know much about what is going on. My brother left India yesterday and my sister left this morning. I am scheduled to fly out in a few hours too. But my heart just won't let me do it. I am most probably going to have to resign at my workplace and stay with them until she is better again. Sorry to moan but today isn't much of a happy one for me. I would like to know how the disease actually gets so busy that it takes perfectly healthy people down even in a span of a few months, although they are on chemo and other such drugs. And so would every researcher in the world. They are trying. As far as I can see, cancer is complicated. It may be driven by one mutation but there's usually others that help it and hide it from natural defenses (like DNA repair or self-destruction, etc.). And animal cells are pretty adaptive already -- over millions(?) of years living cells have learned all sorts of adaptations and backup mechanisms for coping with changes in their environment, changes in available resources, and unfavorable environmental toxins or poisons. Unfortunately, cancer cells know these same adaptive tricks, too.